Natural ventilation is driven by temperature differences and wind pressure. Warm air is lighter than cold air. That causes the stack effect, which means that warm air inside a building will rise. The warm air will leave the building at the top through leakages, stack ducts or open windows and be replaced by cold air entering the building at ground level. The higher the building, the more powerful the stack effect. For the stack effect to work efficiently, there must be air passages through the building. These can be stairways in combination with windows at both ground level and roof level that can be easily opened at the same time. Due to their position in the roof, VELUX roof windows maximise the ventilation potential of the stack effect. See section 2.5.3 for an example of stack effect. When a building is exposed to wind, air will enter the building at the windward side and leave through openings at the leeward side. The wind pressure is higher on the windward side than on the leeward side. This will drive air from the windward side of the building through the building to the leeward side. The shape of the building and the surrounding landscape or buildings have an impact on the air flow. 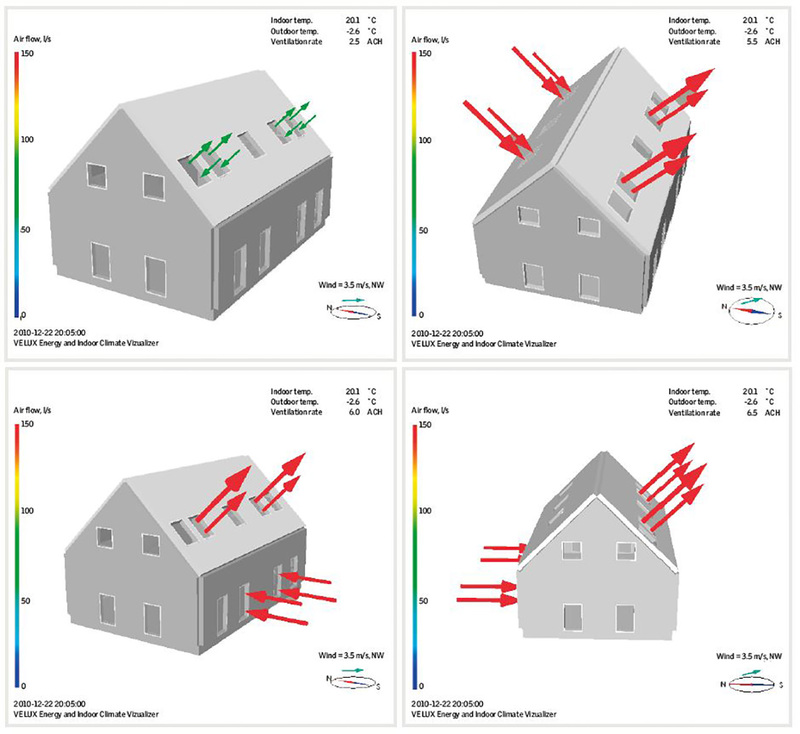 The magnitude of the pressure difference generated by wind pressure is determined automatically as part of a simulation in tools like the VELUX Energy and Indoor Climate Visualizer. Typical values can be found in standards (e.g. BS5925:1991, DIN1946­6:2009). See section 2.5.3 for an example of wind driven natural ventilation. The higher the windows are placed and the larger the temperature difference, the more powerful the stack effect. Therefore, in a building that uses VELUX roof windows for natural ventilation, the stack effect is greater than in a building with only facade windows. Example from MH 2020: In the French Model Home, Maison Air et Lumière (MAL), the indoor air quality was evaluated with special focus on the effects of the natural ventilation system during summer. The evaluation was based on the occupied period from September 2012 to August 2013 for the family of four living in the house, with CO2 levels evaluated to Active House specifications, 2nd edition (Active house, 2013). There was a general tendency towards better indoor air quality (indicated by lower CO2 levels) in summer using natural ventilation than in winter using mechanical ventilation. It was shown in the bedrooms, living spaces and mezzanine that openable roof windows help maintain low CO2 levels. See Figure 2.5.1 below for mezzanine 2 (Plesner et al, 2014). ​Figure 2.5.1 Window opening degrees and CO2 levels for mezzanine 2 (1st floor) in June 2013. 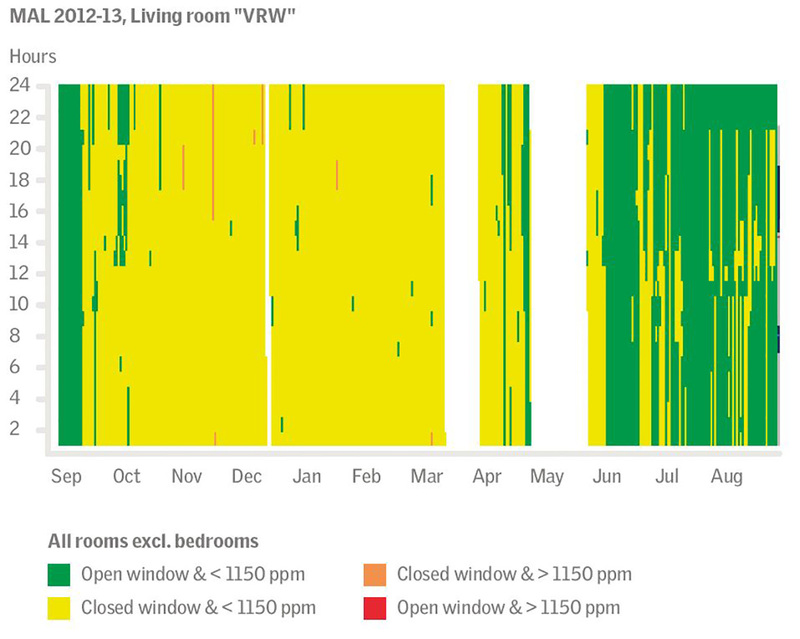 The living room is also shown as a temporal map, illustrating that, for the vast majority of hours when roof windows are open, CO2 levels below 1 150 ppm (green), are achieved, which, in this case, is considered as satisfactory indoor air quality. There are no periods with open windows and high CO2 levels. 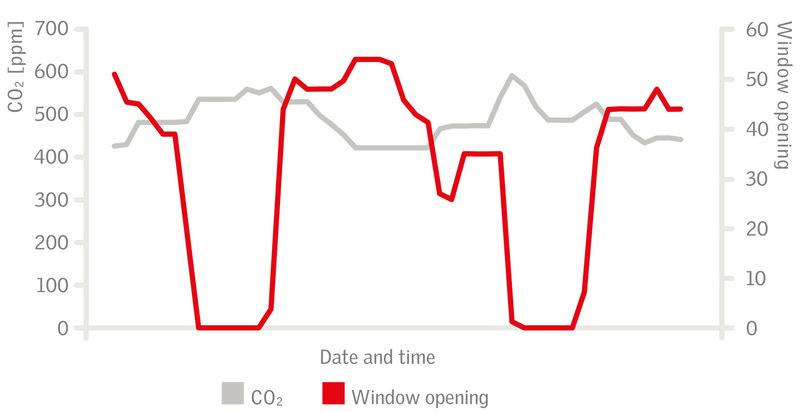 ​Figure 2.5.2 Window opening and CO2 levels for roof windows in living room. All the rooms in MAL were evaluated and achieved category 1-2 (<1 150 ppm) in summer for 95% of the time and category 1-2 for the entire year. The results show a satisfactory indoor air quality for the house. See Figure 2.5.3 below. ​Figure 2.5.3 All-year average CO2​ levels for all rooms and for all hours excl. bedrooms. The ventilation flap on VELUX roof windows can be used to provide a continuous flow of fresh air into the building. ​Figure 2.5.4 Animation of ventilation flows by VELUX Energy and Indoor Climate Visualizer. Background ventilation with ventilation flap The example investigates the background ventilation rate that can be achieved with different numbers of roof windows per floor area. Two ratios of windows to floor area are used, i.e. 10% and 20%. The house is in Berlin, Germany. Figure 2.5.4 shows the ventilation flows on 7 January, with outflows in the range of 2­-6 l/s per window. Figure 2.5.5 The part of the year with a CO2 level below 750 ppm is used as an indicator of good air quality. 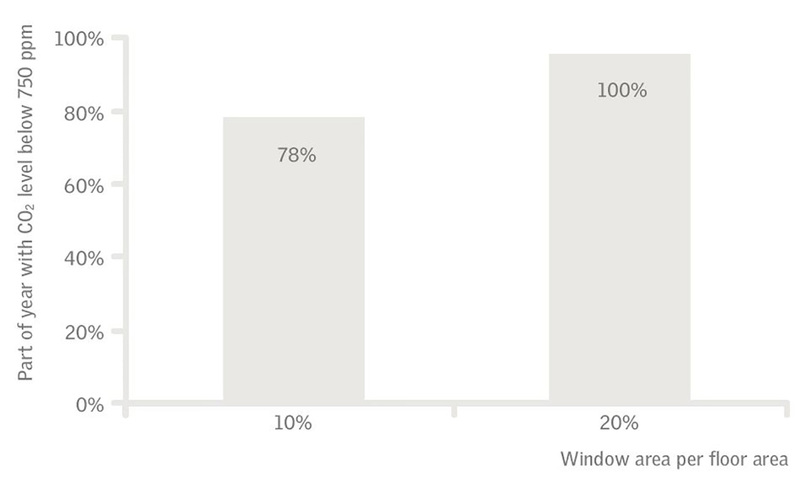 This is achieved for 78% of the year with 10% windows to floor area, while it is increased to almost 100% with 20% window area to floor area ratio. An airing is a short period with a high ventilation rate due to one or more open windows. Airing removes odours and humidity efficiently at the time and place of generation. The effect of airing depends on how many windows are opened and how they are located in relation to each other. The most efficient airing is when stack effect and wind pressure are used by opening windows at opposite facades and different heights. 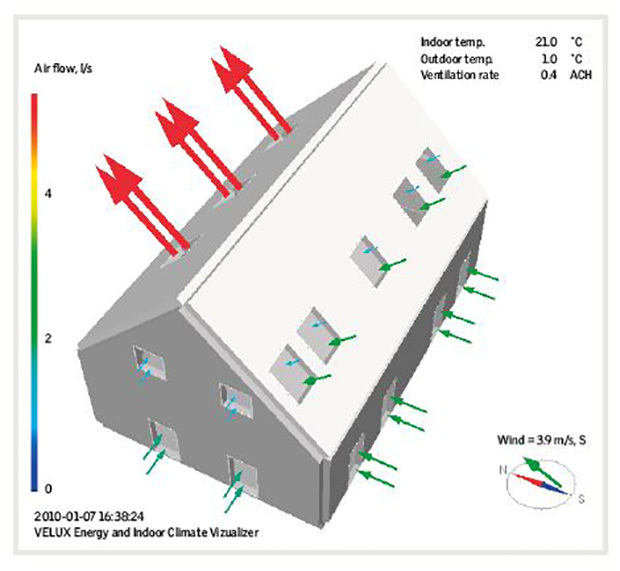 Ventilation rates achieved with airing are calculated with the VELUX Energy and Indoor Climate Visualizer. Four windows used for airing, and the ventilation rates achieved with single-sided airings, cross-ventilation and stack ventilation are found for a summer and a winter situation. The house is located in Berlin, Germany. ​Figure 2.5.6 Animation of window air flows calculated with VELUX Energy and Indoor Climate Visualizer. The images from the animation of ventilation on 22 December during the morning airing show single-sided, cross-ventilation, stack effect and combined stack effect and cross-ventilation. 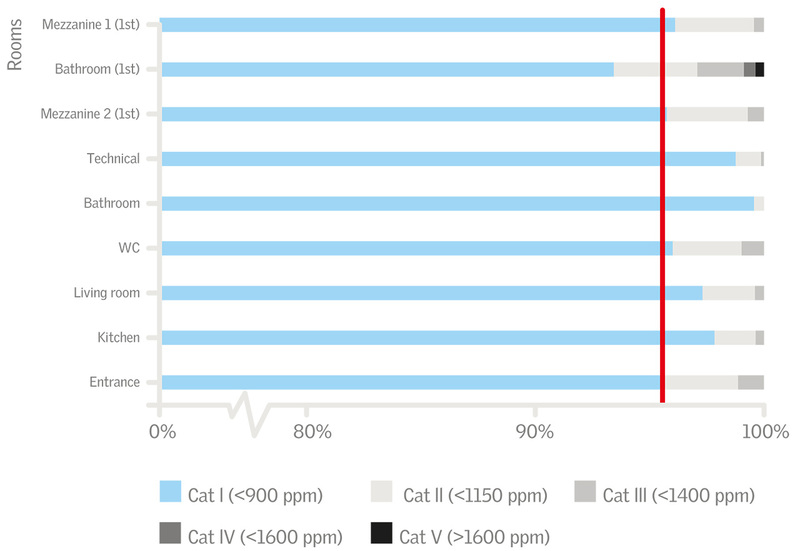 The ventilation rates that occur during the airing are shown in the table below. The ventilation rates achieved with airings are in the range of 1.5 ACH to 5.0 ACH, which is up to ten times higher than the background ventilation rate of 0.5 ACH. The highest ventilation rates in the example were achieved with combined stack effect and cross-ventilation (5.0 ­ 6.5 ACH), then stack effect (4.5 – 6.0 ACH), followed by cross-ventilation (2.5 – 5.5 ACH) and single-sided ventilation (1.5 – 2.5 ACH). These ventilation rates are based on specific opening areas. Larger ACH values can be achieved with larger opening areas, which is mainly relevant for ventilative cooling purposes. In the French Model Home, Maison Air et Lumière (MAL), values up to 20 ACH were measured during the summer 2012 (Favre et al., 2013). The effect on the air quality with combined stack and cross-ventilation is investigated. The part of the year with a CO2­ level below 900 ppm is determined, as well as the additional energy demand (and associated cost). A gas price of 0.085€/kWh is used (Europe’s Energy Portal, 2010). The results show that airings increases the part of the year with a CO2 ­ level below 900 ppm from 62% to 77%, - a substantial increase of 24%. The energy costs increase from 3.9 to 4.3 €/m² per year – a 10% increase. The ventilation flap can be used to provide background ventilation, which will achieve good indoor air quality when the house is not used to its full capacity. During activities like cooking, cleaning and showering airings should be used. A combination of VELUX roof windows and facade windows provides efficient airings with stack effect and cross-ventilation. The combination of background ventilation and airings is the best strategy to achieve good air quality at a reasonable energy demand, as short airings are more efficient than continuous ventilation (Heiselberg and Perino, 2010; Perino and Heiselberg, 2009). Airings can cause draughts, but by making short and efficient airings, the problem can be minimised. See design advice for specific building types in section 2.6.1. In warm summers, natural ventilation can be used to maintain a comfortable indoor temperature. In this situation there is no heat loss to consider – on the contrary, there is a potential for saving energy for cooling, with air conditioning, if it is installed in the building. Increased ventilation rates in summer prevent overheating and the increased air motion is pleasant when it is warm. See section 3.5.3 in the Thermal Comfort chapter for an example of use of both solar shading and natural ventilation to maintain thermal comfort. The large air flow rates provided by natural ventilation during summer facilitate very low CO2 levels in the indoor air – at no energy cost. The use of natural ventilation to improve thermal comfort in warm periods is explained in more detail in the Thermal Comfort chapter. The VELUX INTEGRA and SOLAR windows can be programmed to open automatically. This can be very helpful in a busy daily routine, where there might not always be time to do the required airings. Windows in selected rooms of the house can be programmed to open for, say, 10 minutes in the morning and the afternoon, and at midday on weekends. The ventilation flap can be programmed to open when the occupants are at home, or during the entire day or night, to provide background ventilation. Windows installed in bedrooms can be programmed to open the flap during the night. If the occupants accept that the window is opened during the night, a few automatic airings can be programmed during the night as well. A consequence of the increased airtightness of buildings is the increased need for additional ventilation in order to obtain a good and healthy indoor environment. Europe’s Energy Portal (2010) www.energy.eu (accessed: 2010-06-08). Favre, B., Cohen, M., Vorger, E., Mejri, O., Peuportier, B. (2013) Evaluation of ventilative cooling in a single family house (pp. 1–131). Heiselberg, P., and Perino, M. (2010) Short-term airing by natural ventilation – implication on IAQ and thermal comfort, Indoor Air, pp. 126-140. Plesner C., Duer, K. (2014) Evaluation of indoor air quality in a single-family active house, Indoor Air conference 2014.